Bottomley and Ormerod, Int. J. Sci. Ed, 1981,3,329. Trumper, J. Sci. Ed. Tech.,2006, 15, 47. Morse, R. (2009). How Scientists Do Science. 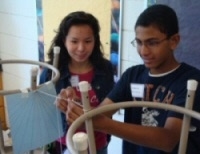 Engaging Students in a Real-world Science Experience. Michigan Alliance of Gifted Educators Newsletter, Fall 2009. Morse, P.D.,II, Morse, K.A., Heiss, A. (2012). The Steppingstone Magnetic Resonance Training Center - Opportunities for Students and Faculty in a True Research Laboratory Setting. In R. Yager (Ed. ), Exemplary science for building interest in STEM careers (pp. 145-159). Arlington, VA: NSTA Press. Morse, R. (2016). How to retire and still make a difference in the world with EPR. Chapter One. epr Newsletter, Volume 26(2), pp 25. Uppal, S. (2012). Free Radical Generation during Roasting of Coffee Beans from Panama. epr Newsletter, Volume 22(1), pp 19.